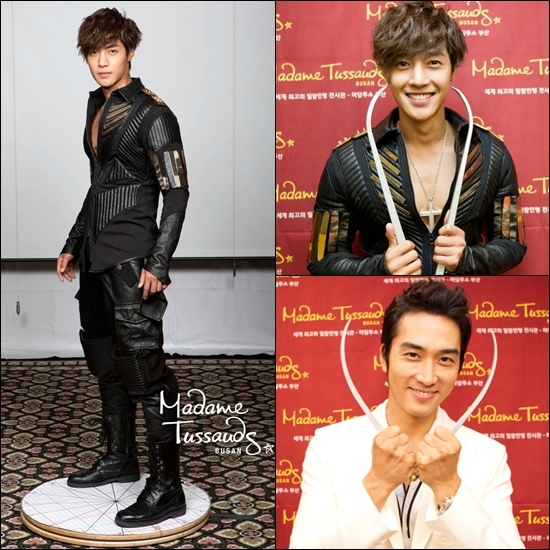 MANILA, Philippines - Hallyu stars Kim Hyun Joong and Song Seung-heon will be immortalized in wax at Madame Tussauds wax museum in Busan, South Korea. The wax figures of the two Korean stars will be unveiled in December, according to an announcement by Madame Tussauds Busan. The Busan branch of the wax museum opened in June at Shinsegae Centum City, the world's largest department store. In making sure that the wax figures are accurate in size and look, Kim Hyun Joong and Song Seung-heon spent three hours each on a turntable where their photos were taken. Their body measurements were also taken down to the finest details for accuracy. The two stars were chosen for the wax figures because of their popularity not only in South Korea but in Asia as well. He also held fan meetings this year in Asian countries including Thailand and Singapore. He is set to release his first Japanese album titled "unlimited" on Dec. 12 that will include 14 tracks. More, he will be starring in a new Korean drama, "City Conquest. "On the other hand, Song Seung-heon is one of Korea's most popular actors. He is best known for his roles in Korean dramas "Autumn In My Heart" and "East of Eden." This year, he starred in the drama "Dr. Jin" along with Park Min-young and Kim Jaejoong. Kim Hyun Joong and Song Seung-heon will join hallyu stars Lee Min-ho and 2PM's Nichkhun who have their own wax figures displayed in Shanghai and Bangkok, respectively. The wax figures of Kim Hyun Joong and Song Seung-heon will be additions to the collection currently displayed at Madame Tussauds Busan. The museum currently displays the wax figures of famous celebrities including Nicole Kidman, Julia Roberts, Lady Gaga, David Beckham, Johnny Depp and Elvis Presley. The Madame Tussauds Busan is open until March next year but the museum says that "if South Korean residents and international visitors enjoy it as much as the other 13 Madame Tussauds attractions around the world, then we will look at making it a permanent feature in the future."